Back by popular demand is the super bright 20 3 LED Brilliant Tent Light from Kampa. 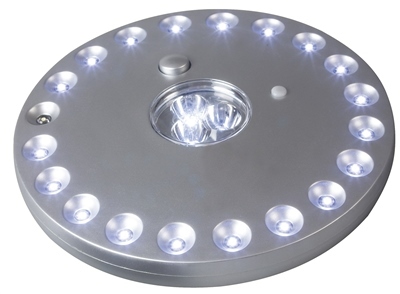 This unique Tent Light offers three different light settings as well as a wall mount, hanging/stand feature and an ultra strong magnet for securing onto metal. One click of the On button will activate the three centre LED’s only, a second click will activate the outer 20 LED’s only, and a third click will activate all 23 super bright LED bulbs. Kampa have provided their Brilliant Tent Light with ultra low power consumption bulbs, this means you will never have to replace a single LED. Read below for this Brilliant Tent Lights full specification. *Based on optimum conditions. Battery life can be effected by battery age and ambient outside temperature. A really good little light, worked very well for our recent camping trip. The magnet worked well through the tent partitions so could 'fix' it shining into the bed area. item arrived when promised and in good condition. no problems at all. What is the diameter or radius of this product?